Nathalie Virem: What is key to building a successful world-renowned culinary brand such as yours? Eric Ripert: I think the success of the restaurant today is the team we have built over the years. The team members are loyal to us and believe in our philosophy of being in a safe and inspirational environment. Obviously, creating job security through insurance and other benefits definitely helps with loyalty. But also, treating staff with respect, motivating and having opportunities for them, always changing in terms of creativity has been a big part of the success of Le Bernardin. They relay the vision we have at the top by bringing it to the client and creating the experience. Nathalie Virem: The world of gastronomy is known to be highly fast-paced, competitive and stressful. What role does Buddhism play in your culinary art, life and business? Eric Ripert: Buddhism is a very personal experience for me. It’s a spirituality that speaks to me, has made me a better person over the years, and of course, it’s a work in progress. However, I do not try to convert the team, obviously. If I bring some Buddhist philosophy to work, it’s in a very secular or scientific way. I try to bring the good values of Buddhism and find a message that will speak to everyone. So, Buddhism is, again, my guidance, and I have many teachers — I practice every day. Trying to find inner peace is a challenge every day, but it’s something that can be achieved. You cannot necessarily see the difference on the next day, but when you look back at ten years ago or five years ago, three years ago, six months ago, you can see the huge difference that it has made, in a positive way. Nathalie Virem: How does one’s diet affect their mental health? Eric Ripert: Well, you are what you eat. And you are what you drink as well. Therefore, if you are partying all night and drinking a lot of alcohol, you don’t take care of yourself in terms of adding a well-balanced meal during the day. If you don’t take the time to eat, or you eat a lot of rich, processed food, it will have an impact on you and we know that. I mean, scientists and doctors have proven that not eating well or having a certain discipline will lead to obesity, heart disease, diabetes, and so on. I also believe that it impacts your mood and behavior. Someone who’s not taking care of themselves will probably be more difficult to work with than someone who’s self-conscious. Of course, we try to encourage everyone to be especially savvy in the kitchen -since we are so close to chocolate and all the goodies we are not supposed to eat so much. We try to teach everyone how to find a certain balance for themselves. Nathalie Virem: What are some of the key nutrients we should eat daily to increase our mental performance, focus and energy? Eric Ripert: I strongly believe that a vegan/vegetarian diet is definitely helpful in having a clear, focused mind and healthy body. Seafood has many benefits to bring to our body as well, and then we need to eat meat, I mean ultimately we are omnivores, so I’m not anti-dairies and anti-meat protein or animal protein. However, I have the tendency to mostly eat vegetables and fruits when they are in season and stay well balanced in between fiber and starch. You can eat meat — beef, pork, chicken — any kind of seafood and vegetables, but not eating excessively is key. Nathalie Virem: People seem to be more conscious about their eating habits. Why do you think that is the case? Eric Ripert: Yes, people are more conscious about their eating habits, for sure. The reason is, we’re getting a lot of information. We are being educated much more than years ago. The scientific world has evolved tremendously; I’m talking about medicine, especially. The fact that we get information from the media and from people who research helps us have a better way of living and eating. Do you want yourself, family, and children to drink milk that has antibiotics, growing hormones, and pesticides? Or you want the option of milk that doesn’t have all that? Do you want a chicken that was happy in the field or one raised in a 6×6 cage with no daylight, fed terrible food and injected with chemicals? If you have the choice, you don’t want to put in your body something so toxic in your body. That’s why we are seeing more people changing their diets; all that we see and read dictate a little bit what we do. Nathalie Virem: We have a ‘’no sleep’’ culture, encouraged by the heavy use of technology and long working hours. Are there some organic foods to help regulate sleeping patterns? Eric Ripert: Again, if you eat very rich food, you will have a hard time going to sleep, as anyone who has a huge steak at night will attest to. Someone who eats lighter will probably fall asleep more easily. So, it’s a matter of choosing your food, not being excessive with alcohol, because it may makes you immediately sleepy, but you wake up very quickly and are dehydrated. Adding certain rituals such as not looking at your cell phone, especially the news we are bombarded with and having down time before sleep also helps a lot, especially for someone who’s on their computer or cell phone and suddenly turns them off — going to sleep as we know takes time. That is because our mind is overly stimulated by all the information we’re getting. In between that and the stress of the day, and the food you eat, you may have a hard time going to sleep. But again, if you have a few minutes to relax, read a book, create night-time habits that are repetitive to ease you into your sleep. Nathalie Virem: Tell us about your upcoming projects. 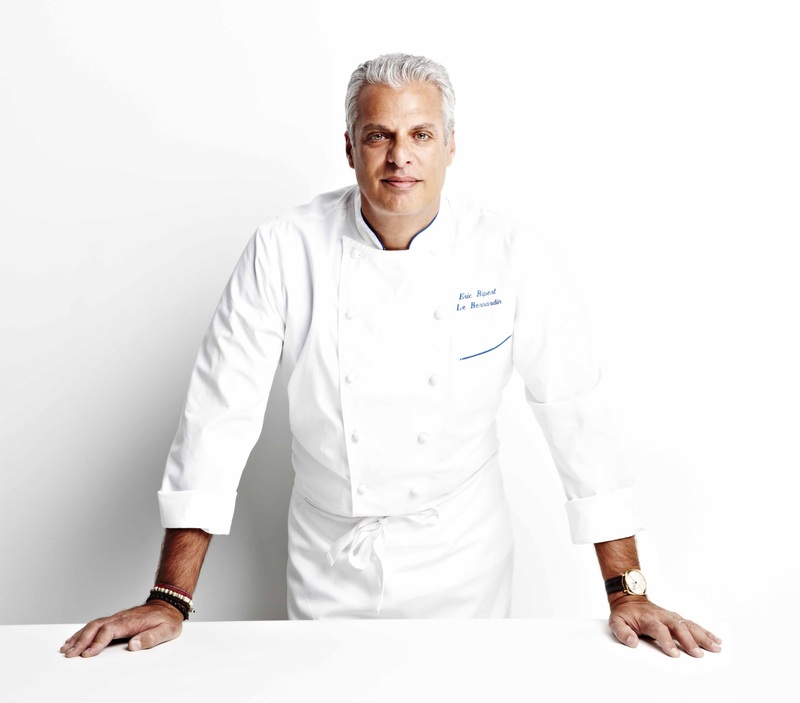 Eric Ripert: What’s coming? We are working on the fall menu. Seems like a simple answer, but you know, we work in the kitchen like fashion designers. We create dishes like they create collections — it’s a lot of work. I have no intention to go open restaurants here and there. I love television so I’m trying to get something like I have done previously [Avec Eric, On The Table or Get Toasted]. If I can do that and have Le Bernardin and the team, I’m a happy man. Eric Ripert is a French chef, author and television personality specializing in modern French cuisine and noted for his work with seafood. Ripert’s flagship restaurant, Le Bernardin, located in New York City, has been ranked among the best restaurants in the world by culinary magazines and S. Pellegrino’s annual list of “The World’s 50 Best Restaurants.” Ripert is friends with and has appeared on many episodes of Anthony Bourdain’s No Reservations and Anthony Bourdain: Parts Unknown. Most recently he has launched a series of brief online cooking videos called “Get Toasted” on his website AVECERIC.com which focuses on easy and quick meals that can be prepared and cooked in minutes with a toaster oven.